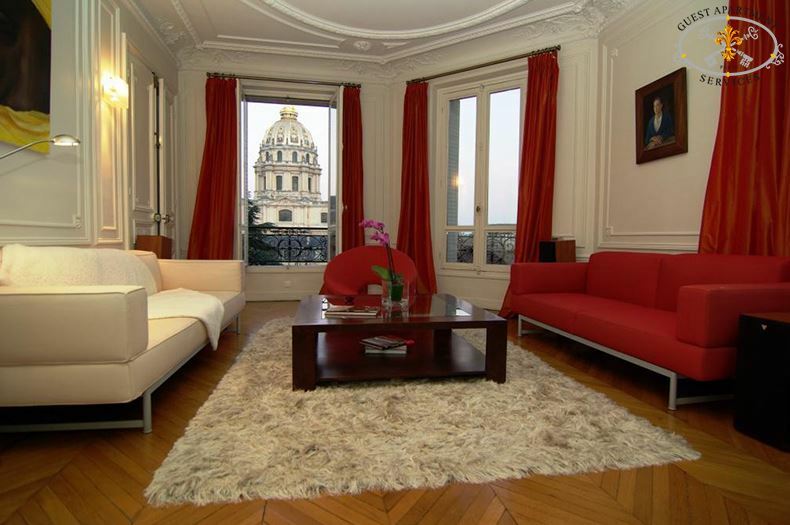 This luxurious 150 square meters Paris vacation rental apartment is in an elegant Belle Epoque building with stunning views of the Invalides Dome. 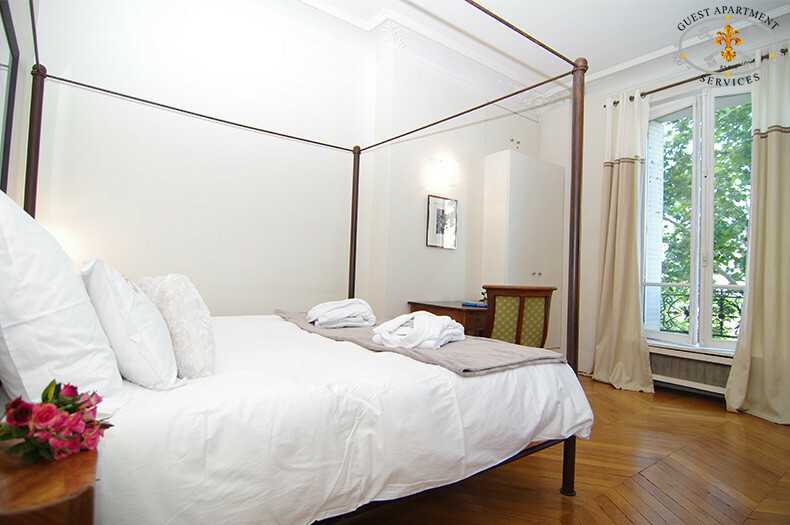 3rd : two single beds. 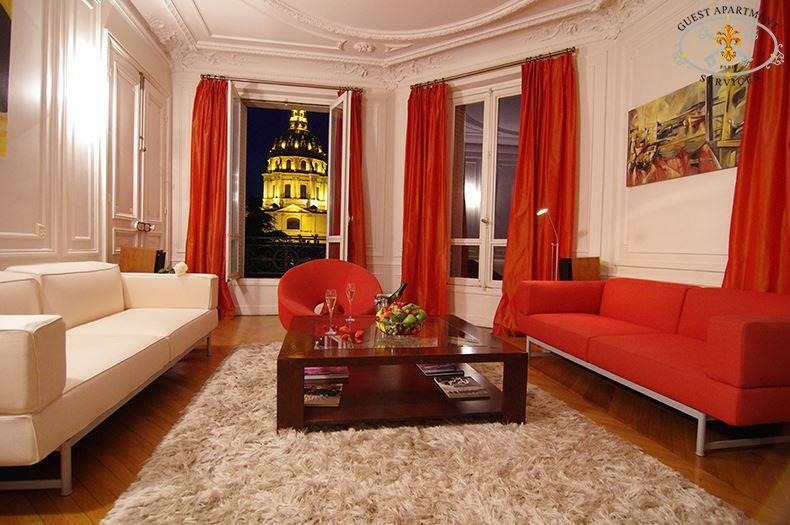 This astonishing and luxurious 150 square meters Paris vacation rental apartment is in an elegant Belle Epoque building with stunning views of Louis XIV's seventeenth century Les Invalides hospital and now military museum.The Invalides area is known for its many elegant mansions (Hôtels Particuliers) from the 18th century, which now house the headquarters of the civil service, embassies and banks. 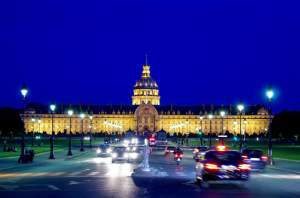 The esplanade of the "Champs De Mars", lined with trees, leads majestically to Paris' most decorated bridge, the Pont Alexandre III, crossing the Seine to the Grand Palais and the round point of the Champs Elysées. 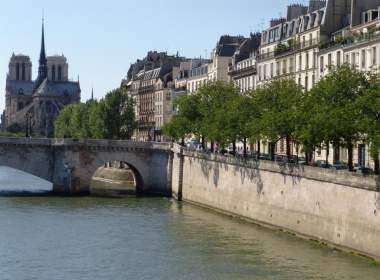 Beautiful walks along the river Seine take you to Paris' major cultural institutions: the Louvre Museum, Orsay Museum, Beaux Arts Museum, Eiffel Tower, Saint Germain area, Champs Elysées and its fabulous shopping district, as well as the every day conveniences of the shops along nearby Rue de Grenelle. SHOPPING & RESTAURANTS: The famous Rue Clair which is next to the property, whithin 4 minutes walking distince, will offer you all daily shopping you may need with several supermakets, bakeries, services, fines shops & several small bistots and nice restaurants. 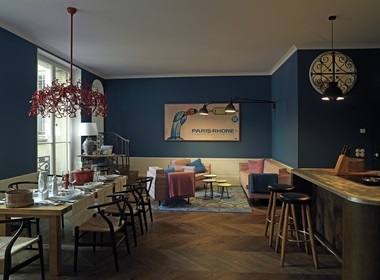 The foyer entrance of this Haussmannian building has marble columns and floor, a second door requiring a door code and your gueststo use the intercom device. The red carpet on the stairs and the exquisiteness of the foyer is a foretaste of the luxury that awaits you on the third floor accessible by elevator. 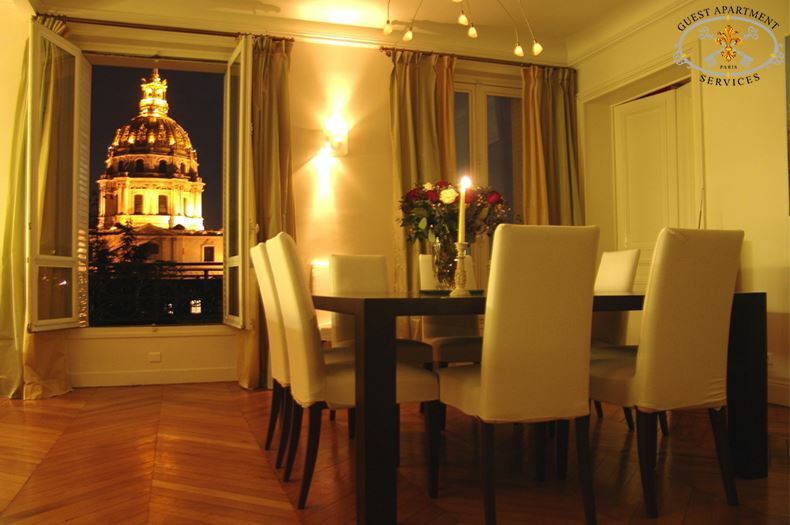 Extraordinary views on the Invalides from the living room, the kitchen/dining room, master bedroom and bath. High ceilings and mouldings . Marble fire places. Chevron parquet floors. Very nice and elegant living space. 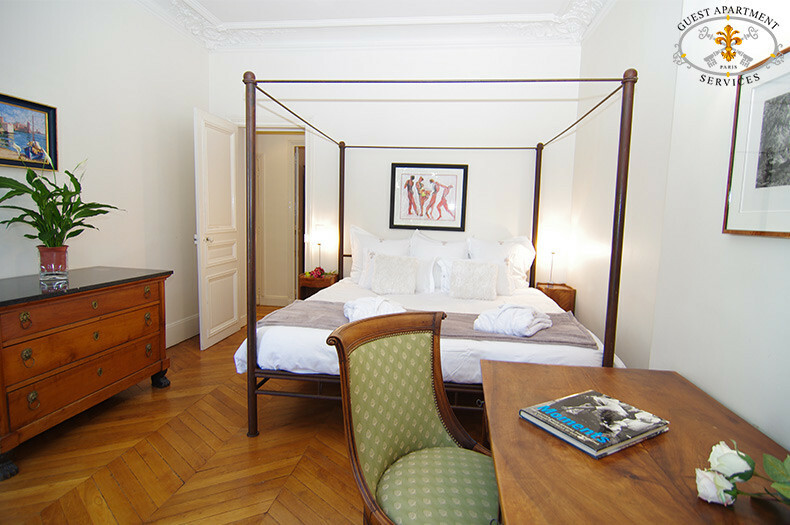 The classicism and the elegance of the apartment comes from its Belle Epoque design heightened by the light, modern decoration. 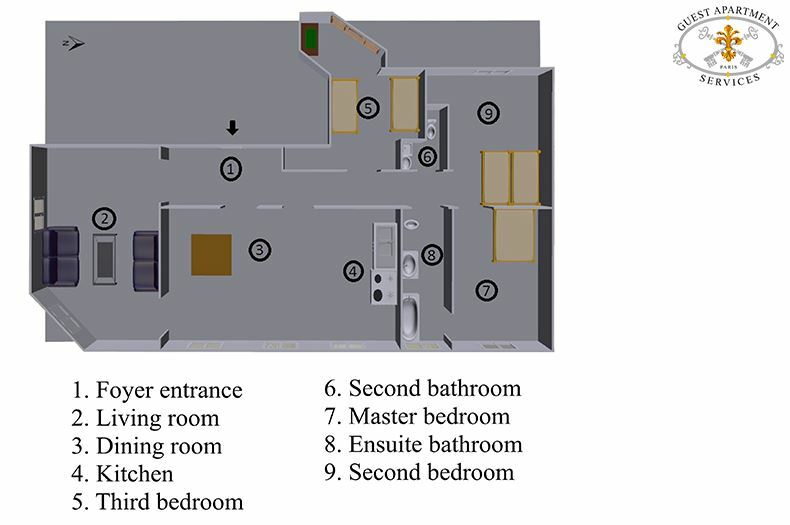 A corridor adjoins each room and ends at the second bedroom. 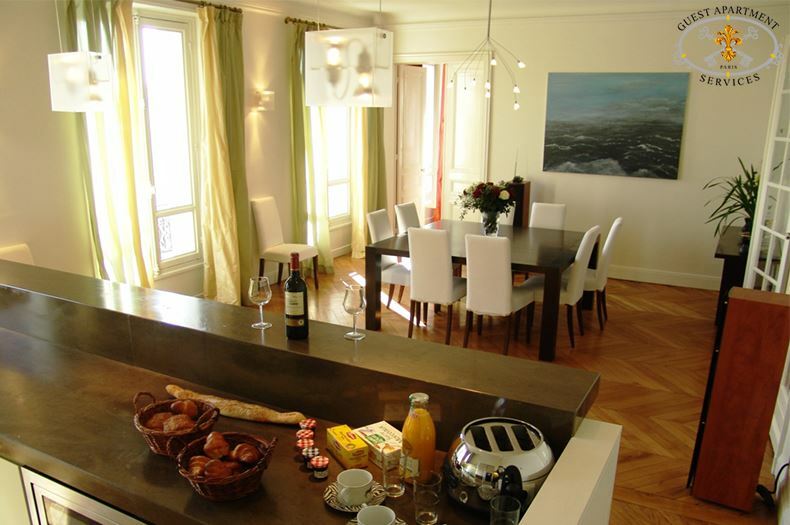 It is decorated with a large modern painting, heavy wooden console and wrought iron chairs with white cushioned seats. 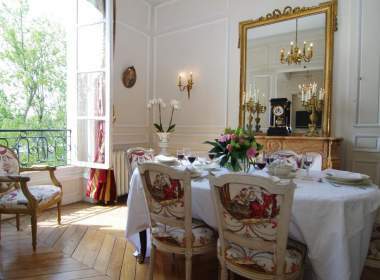 Behind the two French doors from the hall corridor, a spacious kitchen/dining room is bathed in day-light from three large windows decorated with attractive green and yellow taffeta curtains. 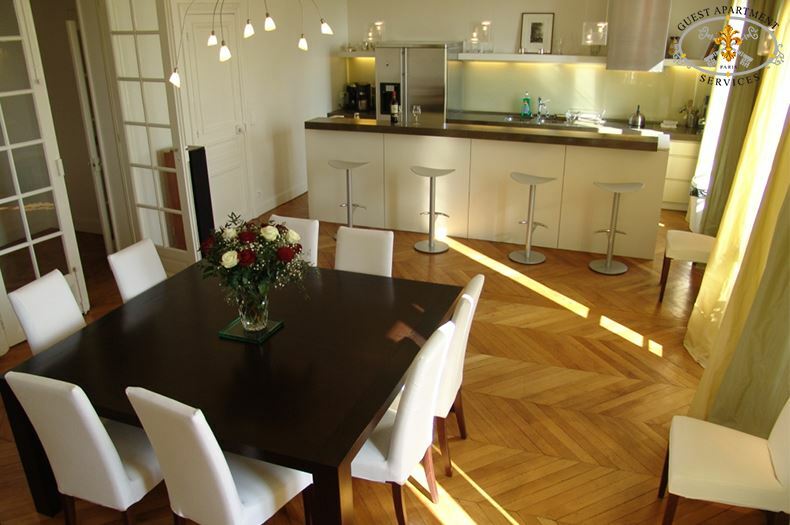 At the center of the dining area is a large square table and eight wooden chairs with white backs and seats. Lovely modern candelabra and sconces delicately light and decorate the room, as does a pretty seascape. The kitchen is visually separated from the dining room by ornate crown mouldings and hanging lamps over a long, gray sandstone counter /bar, equipped for serving cocktails, for casual dining, or watching the chef at work. A large wooden work surface opposite the stone counter/bar contains built-in dishwasher, stove, double sink and storage, with a full-sized American refrigerator /freezer. Microwave, coffee maker, electrical kettle, toaster are available. All utensils and dishes at your disposal. A pair of large doors lead from the dining room to the living room, where lightness, modern design and elegant comfort are the theme. A finely carved chimney with a magnificent sculpture is surmounted by an equally elegant mirror, visually enlarging the room. Red upholstery and taffeta curtains give warmth to the airy atmosphere. 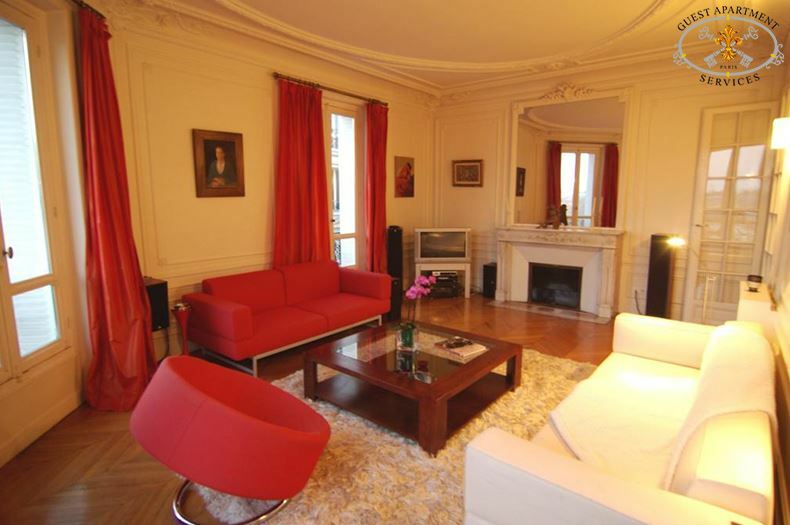 A geometrical red sofa faces a cream coloured one of similar design, with a low wooden table, contemporary arm chair on the side. The wall is decorated with framed lithographs. A TV with home cinema is housed in an aluminium cabinet, with speakers in both living and dining areas. 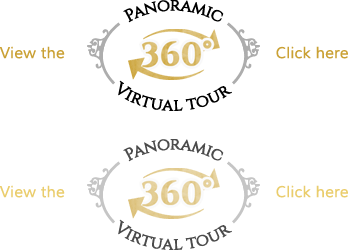 Cable TV with the main international channels are available. An interesting transparent arm chair is placed between the windows. The luxurious marble bathroom has all modern comforts, including bath and multi-spray and massage jets, built in glass shelving, marble counters, base cabinets with built in washing machine/dryer combination, mirrored top cabinets with shelving, towel warmer, and a modern toilet. A second marble bath has a shower with heavy brass fittings and wash basin. 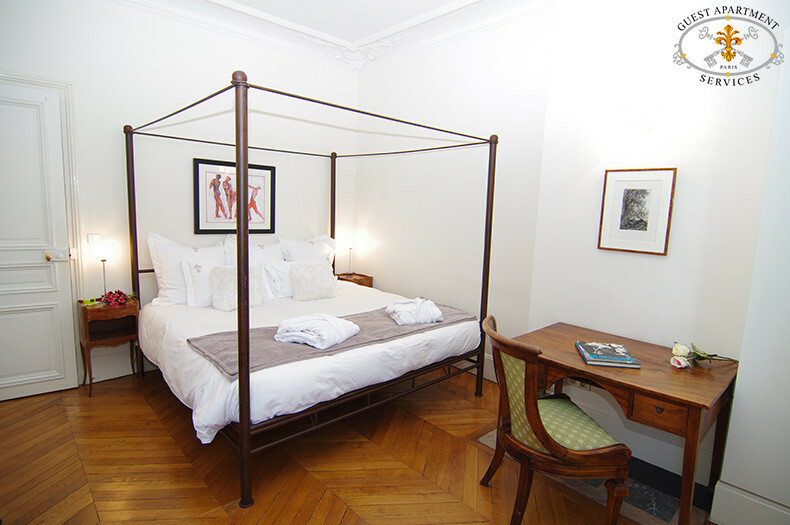 The master bedroom has a wrought iron queen sized canapé bed with sheer curtains. 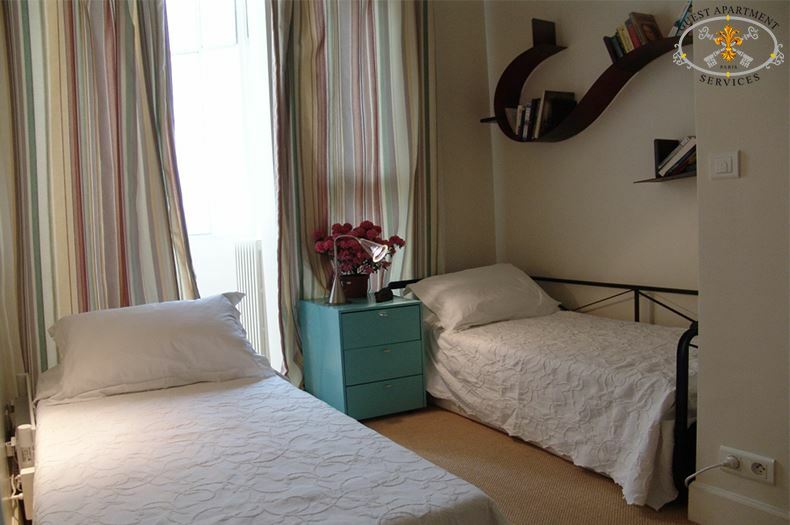 There are two round bedsides tables, each with a lamp, and there is a spacious wardrobe to hang your clothes. 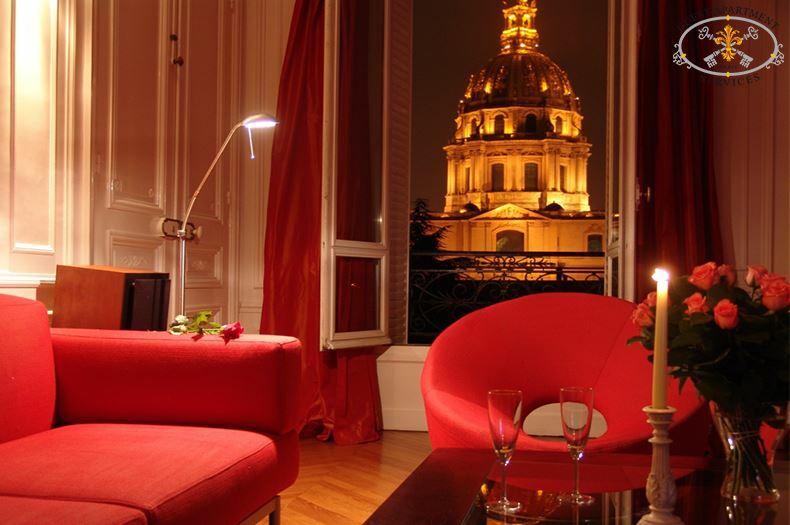 A corner office area of the bedroom is equipped with wooden desk and chair, and has wonderful views of the Invalides. 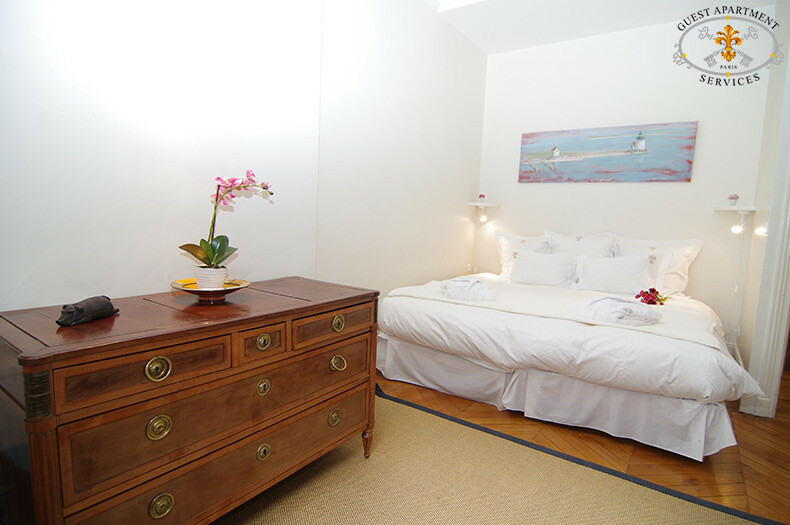 A second separate furnished bedroom welcomes a queen size bed which can be split into twin beds for your convenience. Off the second bedroom, an third smaller bedroom/office has a single bed, desk and chair, and a veranda. This room is large enough to install twin beds. Amenities include cable TV with CNN and major channels, compact stereo/CD player, home cinema, telephone with answering machine.